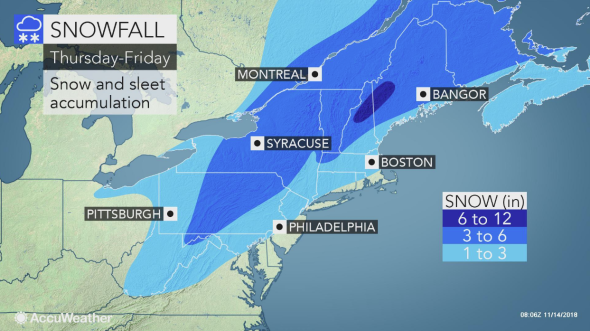 A storm with snow, ice and rain will bring travel disruptions from the Midwest and southern United States to the Northeast spanning Wednesday night to Friday. Motorists and airline passengers in much of the eastern U.S. should be prepared for more delays as a second winterlike storm for this week runs its course ahead of the surge in travel around Thanksgiving. There may be school delays, early dismissals and even closings. A weather pattern more typical of late December or early January will persist across much of the eastern U.S. this week. The pattern not only features much colder-than-average conditions for the middle of November, but is also packed with winter-like storms. Following the most recent, early-week storm with snow, ice and rain, a second storm will take a similar path from the Gulf of Mexico to southeastern Canada during the middle to latter part of this week. However, this new storm will have colder air on both its front and back sides when compared to the early-week storm. That colder air will have significant consequences in terms of the form of precipitation. A snow shovel and snow brush may be valuable tools, and plowing operations may need to be initiated due to the potential for several inches of snow in some areas with this storm. With the wide variety of weather conditions expected this week, download the free AccuWeather app to see what conditions are in store as well as the timing of rain and any ice and snow for your area.